Fall container completed in less than 20 minutes. A week or so ago, while I visiting my daughter in Chicago, I happened upon a fun idea for a simple fall container. The container (shown below) was on display at the Morton Arboretum in suburban Chicago. The container itself was large, wide and made of terracotta. It was filled with an assortment of gourds and squashes. Simple, and very pretty. I knew that was an idea I could easily replicate at home, and I had just the container to do it with. A couple of years ago, I bought a small, metal horse trough to use as a planter. I ended up making it into a small water feature this year, which I had emptied out a few weeks ago. 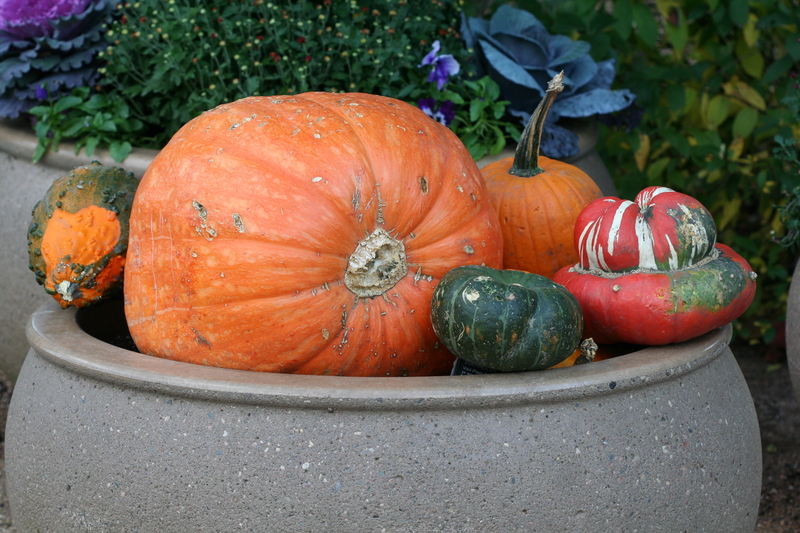 At the Northfield Farmers’ Market last Friday, I found an assortment of squashes. One of the sellers was also selling bouquets made of ornamental cabbage and kale. Cute! I bought one and decided to use it as an accent in the container. The kale and ornamental cabbages are basically cut flowers, so I needed to keep them in water. To set up the container and keep the squashes elevated, I flipped a couple of pots over and set them in the trough. 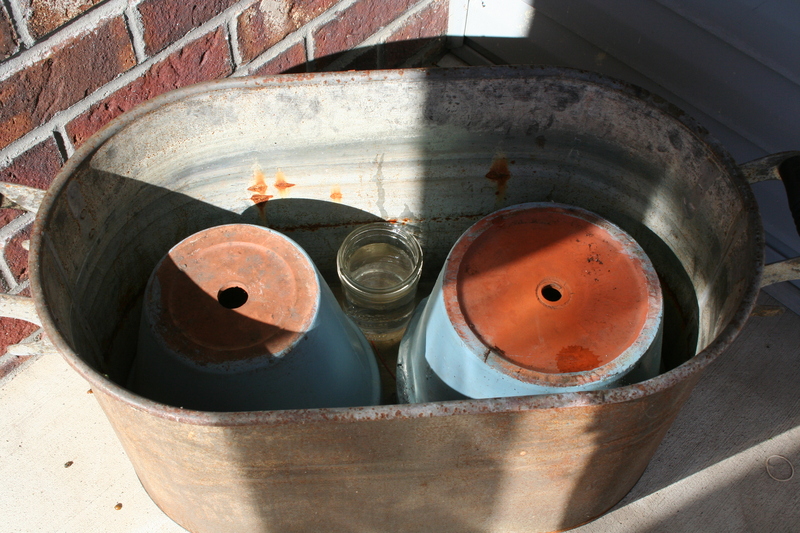 Then I filled a couple of tall canning jars with water and placed one in the back of the container and one in the front. Pots elevate the gourds and a jar of water keeps the kale fresh. I put the kale in the water jar in the back and three of the cabbage in the water jar in front. The squash were balanced on the upside down pots. It looked nice, but I had one more cabbage and a pumpkin left. I put the cabbage in another jar of water set inside a colorful container and set the pumpkin down in front of the trough. Voila! Instant fall container. Once I had everything bought, putting the container together took less than 20 minutes. I’ve tried a couple of fall container ideas before including planting a pumpkin here and here. 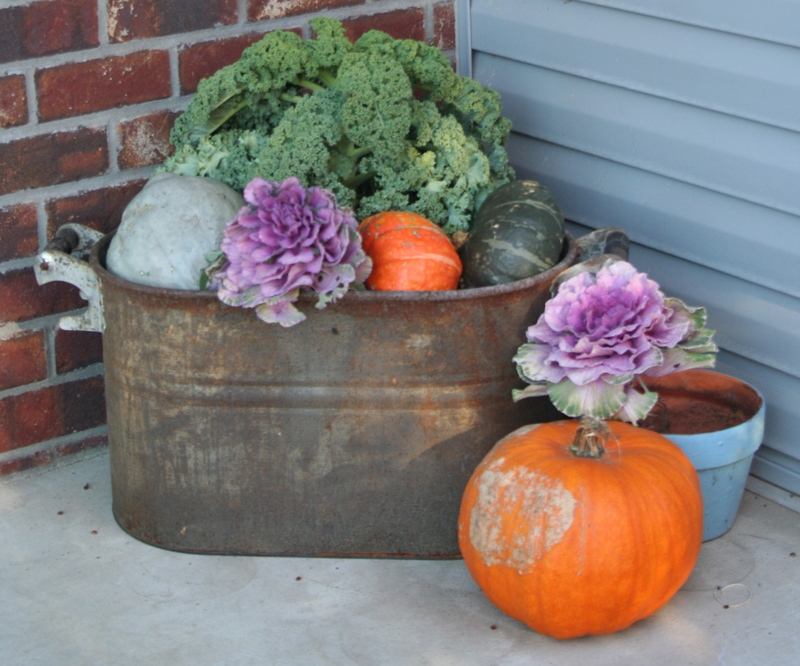 What’s your favorite fall container idea? Love the texture in this arrangement. I like the idea of using squash instead of pumpkins which just get tossed out–unless they are pie pumpkins. 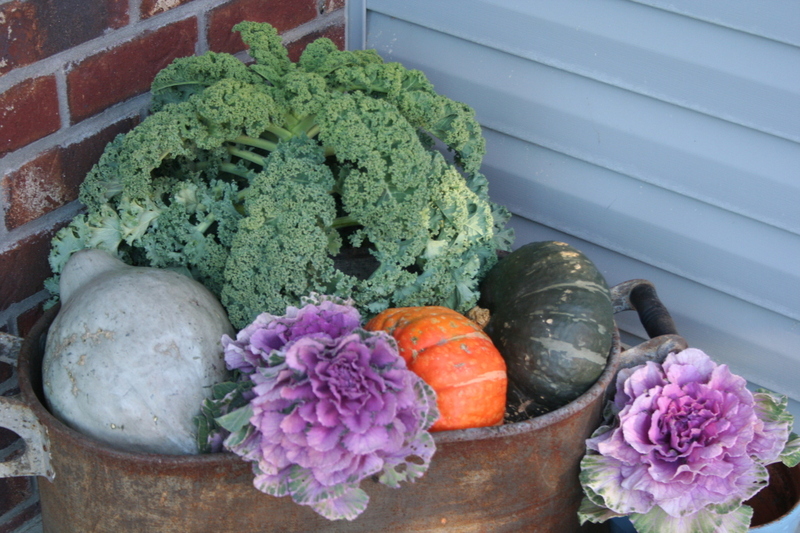 I use squash and pie pumpkins, dry milkweed pods and colorful maple leaves in my window box right now. –A variation on this theme. Milkweed pods are beautiful! I plan to cook the squash before they freeze and change the container to a more holiday look. What a great container arrangement. I’m still trying to empty my summer containers and gave no thought to a fresh and original arrangement. What can I say! Well done decoration! I love it! It looks so natural and vintage! I will definitely search for a container and I will make some decoration for my front door. Thanks for the fresh idea! Regards!